There is a special place in the Smokies for you if you like to fish or walk or just watch your favorite team on TV and snuggle. You will find Caney Creek Cabins tucked away in the Smokies, waiting for you to begin your vacation. All of our super clean cabins and chalets are comfortably furnished down to the last detail. We offer an unmatched location and pure Southern hospitality. ... know the unit you're looking for? Think of us for your WEDDING, FAMILY REUNION or CHURCH! Cozy vacation cabin rentals in between Gatlinburg and Pigeon Forge. Call us anytime to book, or use our easy Really Real-Time online reservations. As you travel from the hustle of Pigeon Forge to the bustle of Gatlinburg, on a road known to the locals as "The Spur", a tiny road crooks off to the right. It's a secret road, a paved road, a beautifully scenic road ~ that leads to a special "holler" deep in the Foothills. As you drive Caney Creek Road, the sound you hear as you enjoy this well-kept secret is the babbling brook and your cabin calling your name. Log cabins and mountain cottages are waiting for you in an idyllic setting. 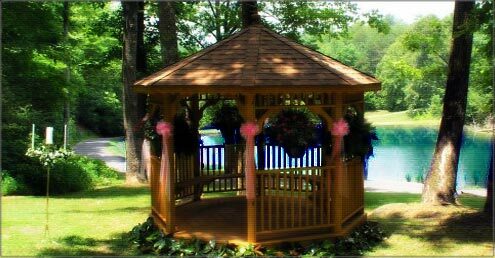 A private fishing lake and a special gazebo are places for pictures and memories. And, if you are in a hurry, there is another short road over Mill Creek into Pigeon Forge's traffic light #10. You owe it to yourselves to take the long way, once!